I met up with existing client and data specialists KETL at the start of the year. At this point, business development manager Helen mentioned that they were aiming to focus on more events this year. As well as the usual exhibition banners (which I’d already designed for them), Helen had a need for a printed white paper to handout when she met people at the events they planned to attend. 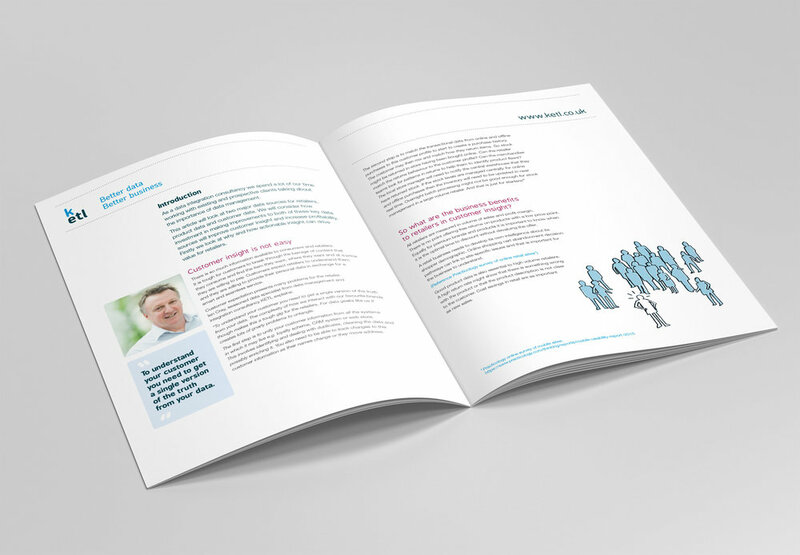 KETL already had a small flyer that they’d used as a handout previously, but Helen felt that they needed to give potential clients something with more ‘proof’, that validated exactly how useful their data strategy could be. 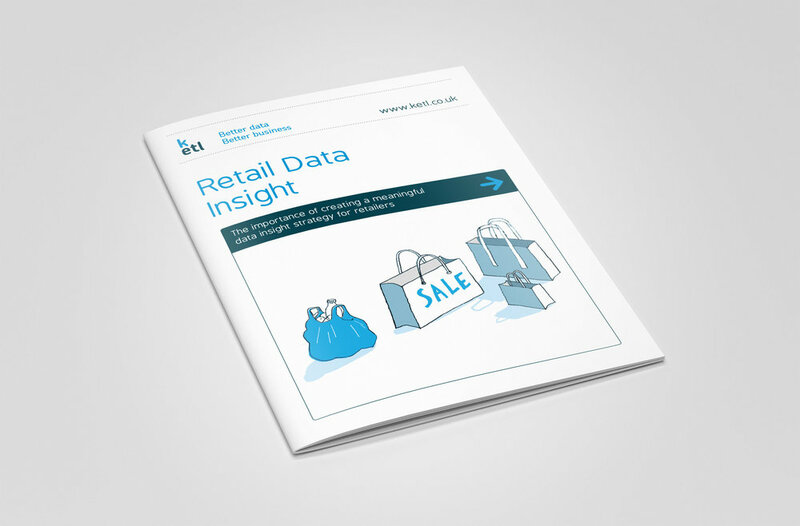 Targeted specifically toward the retail sector, this twelve page A4 white paper brochure contained case studies from Travis Perkins, Marks and Spencer and Monsoon Accessorize. The content, written by KETL, with insights and references from TIBCO Spotfire, Talend and House of Fraser, talked through the investment and management of data sources to improve customer insight and increase profitability..
As demos would be available on the stand, as well as key XCD staff members to talk to, I decided that graphics should focus on a simple overview of the product. Key features and the product journey that a potential customer might take were displayed. Icons and illustrations from the recently launched website were used. This would help to maintain consistency and brand recognition across the two different media types. As well as the stand itself, I also designed a 12 page A4 handout booklet. Entitled, ‘HR Software that works for you – a guide for HR Visionaries’, it ran through eight questions XCD HR typically ask clients. The guide also contained suggestions on where to find help in choosing the right HR solution for a business. Copy content was written by Valuable Content, Bristol. The key was for it to be a genuinely useful and practical guide rather than overtly sales-y. The guide was also set up to be readily available as a download pdf on the new XCD HR website. As part of the white paper, Sarita Harrison, Project Manager, also takes the reader through her thoughts on the biggest factor for determining success in a customer data project. The white paper design uses existing brand illustrations, as well as a clean brand colour palette and typographic style made consistent in an earlier template project by Creative Cadence. The final brochure was printed digitally onto white uncoated stock, using a slightly heavier weight for the cover, to give it a premium feel. Digital print is really economical for this kind of communication. KETL started with a small print run, to gauge how the piece went down with potential customers, with the option to have more printed using the same print specification in the future. Any slight content tweaks can also be made, if they want to update case studies in the piece. This white paper was also hosted as a digital pdf, with live clickable links to some of the sites and videos mentioned in the footnotes.